Game of Thrones: Oathkeeper - TV review | What Hi-Fi? Four seasons in and Game of Thrones has managed to confound both fans of the book and TV show. Oathkeeper, episode four of season four, is perhaps the first major deviation from George R.R. Martin's books, which makes the episode both exciting and befuddling. More on that later. Oathkeeper (referring to the Valyrian sword Jaime gives Brienne) is an elegantly plotted episode, serving its function of manoeuvring elements into place with some solid, intriguing storytelling. 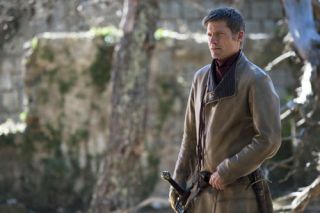 Jaime Lannister (Nickolaj Coster-Waldau) is the focus for much of the episode, meeting with Cersei (Lena Headley), Tyrion (Peter Dinklage) and Brienne (Gwendoline Christie) in King’s Landing. His relationship with Cersei has turned sour with the events of the previous episode driving even more of a wedge between them. Still coping with the death of her son, Cersei lays part of the blame at Jaime’s door and, when she asks for retribution, Jaime’s response is non-committal. His relationship with Tyrion is better, but not by much, with his brother awaiting trial knowing that the jury is likely to execute him. Having one of the series' main characters hemmed into a jail may have robbed the season of some of its charm, but the events of this season have shifted the heavy dramatic lifting from Tyrion to Jaime, who had lingered on the fringes but is now centre stage. And Jaime's change from rogue to knight with responsibilities is emphasised in his relationship with Brienne. Considering the antagonistic to and fro that defined them, they’re now an odd couple with Jaime showing signs of caring about her and Brienne not quite sure how to act on her feelings. When Brienne leaves King’s Landing to look for Sansa Stark at the behest of Jaime, director Michelle MacLaren frames it as a bittersweet moment as another partnership is broken up. Elsewhere we get a brief moment with Sansa (Sophie Turner) and Littlefinger/Peter Baelish (Aidan Gillen) as they head towards to Eeyrie, where Littlefinger reveals he's to be wed to Sansa's aunt, Lady Arryn. Revealing that he was part of the conspiracy to murder Joffrey, Littlefinger’s creepiness is highlighted as he gives Sansa some rather covetous looks. Visually this scene’s subtly fantastic, with the bobbing and swaying of the ship casting sunlight on the actors at specific times, highlighting the shady features of Littlefinger and the confusion (and then understanding) of Sansa as Littlefinger reveals his plans and Sansa realises just what she has unwittingly been dragged into. There are other instances of this happening in the episode (between Margaery and Tommen, for example), creating contrast not only through character interaction but through the lighting too. We can't wait to savour it more when it (eventually) gets a Blu-ray release. Back in King’s Landing Olenna Tyrell (Diana Rigg) is leaving for Highgarden, but not before revealing her part in the plot to kill Joffrey to her niece Margaery (Natalie Dormer. She also gives Magaery a task before she leaves: weave her way in to Tommen’s heart before Cersei can shut her out. And she sets about doing this by introducing herself in Tommen's chamber in the dark of night as we're introduced to book favourite Ser Pounce (Google it). But really, the biggest moments of the episode and the parts that deviated from the book were the events happening up north. Bran and company were captured by the former members of the Black Watch at Craster’s Keep, which we don’t remember happening in the books. The depravity of the scenes here may set a new standard, even for Game of Thrones, as one character drinks out of the skull of a deceased character. That’s quite repellent. It’s all set up for Jon Snow to venture from Castle Black and rescue Bran, but considering this never happened in the book we’re not sure where this will go, a feeling fans of the book won’t be familiar with. And saving the best ‘til last, we now know what’s been happening to the male babies Craster discarded in previous seasons. They’re being turned into White Walkers. It presents more questions than answers, and we have no idea of whether it could spoil events for the next book (Winds of Winter). But this revelation breaks new ground for the series as we reach the second half of the season.